Adrian works through the alphabet, combining one-line definitions with more thoughtful pieces - a laugh-out-loud book on Christians and Christian culture. What are the two most important things in the universe? Bacon sandwiches and salvation, according to Adrian Plass. In this book, he combines one-line definitions with more thoughtful pieces, producing a volume that will make you laugh, cry - and reflect. Despite the fact that someone once offered him five million pounds never to write another word for publication (one hilarious story recounted here) this is a glorious book. Vintage Plass. 'Ineffable: (1) cannot be expressed in words (2) cannot be sworn at. "Healing, life-affirming and full of hope." "Subversive but not destructive, cutting but never unkind, the man helps me to want to remain a Christian. Brilliant, fun, laugh-out-loud stuff." Adrian Plass is one of today's most successful Christian authors. He has written over twenty books in the last eighteen years, including The Son of God is Dancing. 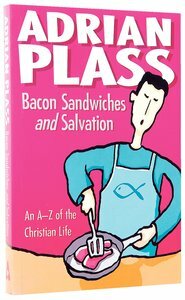 About "Bacon Sandwiches and Salvation"
Adrian Plass has written over thirty books in the last twenty years, full of his uniquely wry observations about church and Christianity. As well as his biographical books, he has written novels, short stories, and collections of poems and sketches. His live presentations are often hilarious, often poignant, with a combination of humour, poetry and storytelling, but always warm and welcoming. He also leads BRF Quiet Days with his wife Bridget.